Cold sores, also called fever blisters, are small, fluid-filled blisters on a raised, red area typically around the mouth. Exposure to the herpes simplex virus causes cold sores to appear, and there is no cure for the virus. Using Vaseline Lip Therapy on the areas of your mouth prone to cold sores may help reduce outbreaks and decrease pain associated with a cold sore. Cold sores can appear after exposure to the herpes simplex virus. 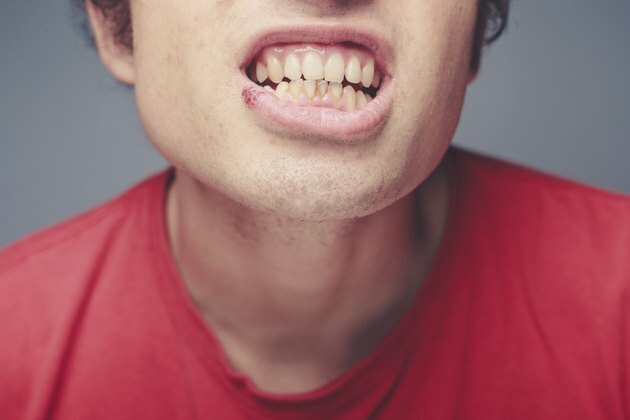 The herpes infection occurs after you have made contact with another person who has an active lesion, such as by sharing utensils, razors, towels, toothbrushes or kissing. Cold sores usually appear between seven and 20 days after exposure and can last up to 14 days. The blisters usually clear up on their own, but they can be painful and uncomfortable. Cold sores cannot be treated with antibiotics because they are caused by a virus. However, using nonprescription ointments can help reduce the pain associated with a cold sore and may even help heal the cold sore. Common products used to reduce the duration of a cold sore include Abreve and Zilactin. Taking ibuprofen or acetaminophen can help relieve pain, along with applying a numbing gel, such as Orajel or Anbesol, on the affected areas. Additionally, applying a cold towel to the cold sore two to three times daily can help reduce pain and swelling. Avoid acidic or citrus foods or drinks during a cold sore outbreak. It might further aggravate the cold sore. Although there is no cure for cold sores, applying Vaseline Lip Therapy may help to prevent an outbreak caused by excessive exposure to sun, cold or harsh temperatures. Applying Vaseline Lip Therapy to an existing cold sore will help keep it moist and prevent it from cracking or bleeding, which can make the cold sore more painful. Wash your hands before and after contact with a cold sore to reduce the spread of the virus. Apply the Vaseline with gloves or a cotton swab. Consult your physician if you have a pre-existing condition that may affect your cold sore or compromise your immune system. Seek medical attention if the cold sores do not clear up on their own within two weeks, if you have severe symptoms associated with the cold sore or if you have frequent outbreaks.